who joined us in the Galapagos. All well and the food which Nicky spent such time in Panama preparing is delicious. [note from Nicky: most recipes are my mother’s – layered ratatouille and chicken with Noilly Prat, for instance – but I also have four Meg Campbell boboties frozen. I’ve made mocha squares this morning and Charles and I take turns making bread – his ciabatta with sunflower seeds yesterday was a great success.] We need to eat food in the freezer and fridge to make space for any fish we may catch. Alex caught a 7kg yellow fin tuna within about 3 mins of putting the line in last week which provided delicious sashimi and tuna steaks. 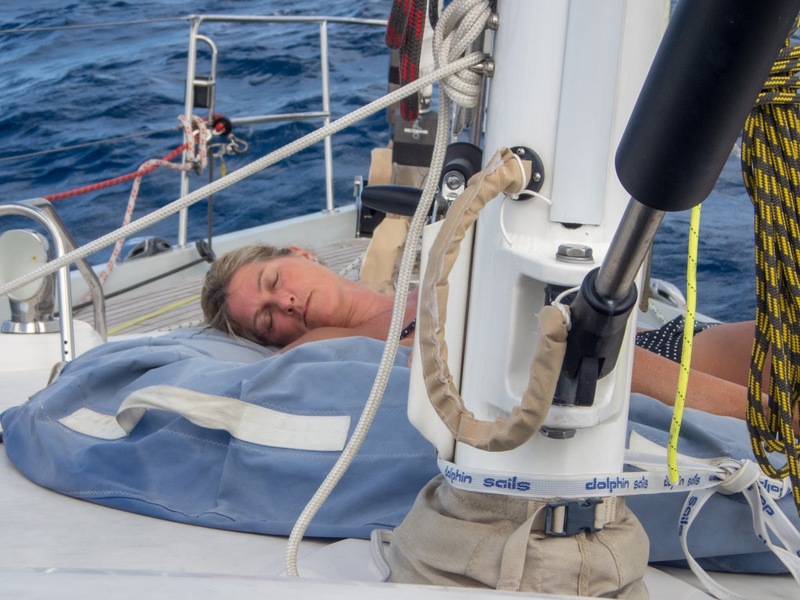 With five on board and single two hour watches, you can get plenty of sleep and we are now adapting to the rhythm of the boat and watches. It is strange to feel so small and alone on a night watch – no other vessels, only stars and sea. We had two dolphins accompanying us day before yesterday and the odd bird flies past, but mostly it’s just…emptiness. The Pacific is huge. 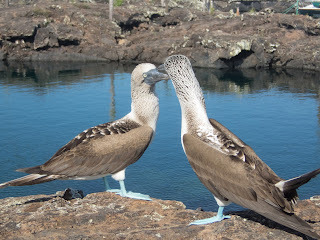 The Galapagos Islands were amazing – wildlife and scenery you can’t see anywhere else. At the airport Nicky managed to get past security into baggage reclaim to meet Alex whom we hadn’t seen since October after his Ambling through Africa, and Pippa whom we last saw in January. Floods! 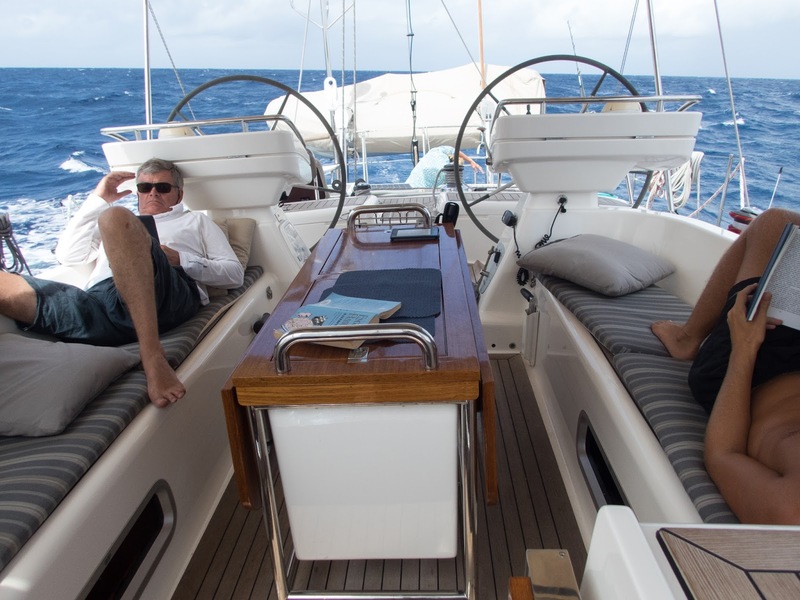 Mike – stand by for Tahiti airport! You kept on thinking what the next superlative could be: we dived with hammerhead and Galapagos sharks off San Cristobal, swam in a ball of fish and watched shoals of 1000 yellow fin tuna and barracuda swim past; we walked volcanoes and volcanic forest paths, stepping over marine iguanas, black as their lava rocks, with spiky crests; we swam with turtles, sea lions and sea horses in Isabela; we visited tortoise rearing centres where we saw tiny babies and 160 year olds (ugly and slow, yet fascinating); and then, just as Pippa was about to leave us, we went snorkelling off Pinnacle Rock on Bartolome (an extraordinary, moon-like place) where we found new reef fish and then three little penguins, who obligingly dived in off the rocks and went fishing right in front of us about a metre away. Oops – I nearly forgot seeing the humpback whales and manta rays, 5m in width, jumping. All the animals are so unafraid that on San Cristobal we saw marine iguanas, blue-footed boobies and a sea lion on the same rock next to the pier. 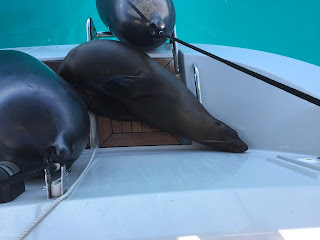 The steps to the dock were covered in sea lions jostling for the best spot. [Nicky again: I’m embroidering animals and birds we’ve seen – at the moment I’m sewing turquoise feet on a pair of blue-footed boobies, which we saw courting and nesting]. 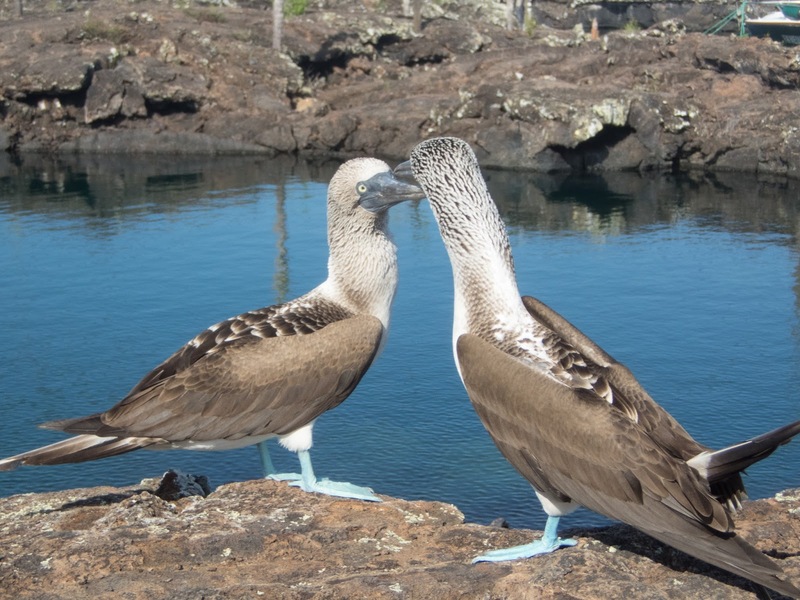 I hope the Ecuadorians keep the Galapagos safe and keep the visitor numbers balanced. On the one hand it is good it is all very controlled; but on the other hand there are masses of regulations, some more sensible than others, everything is a tour which provides employment but does make it all feel a bit packaged. 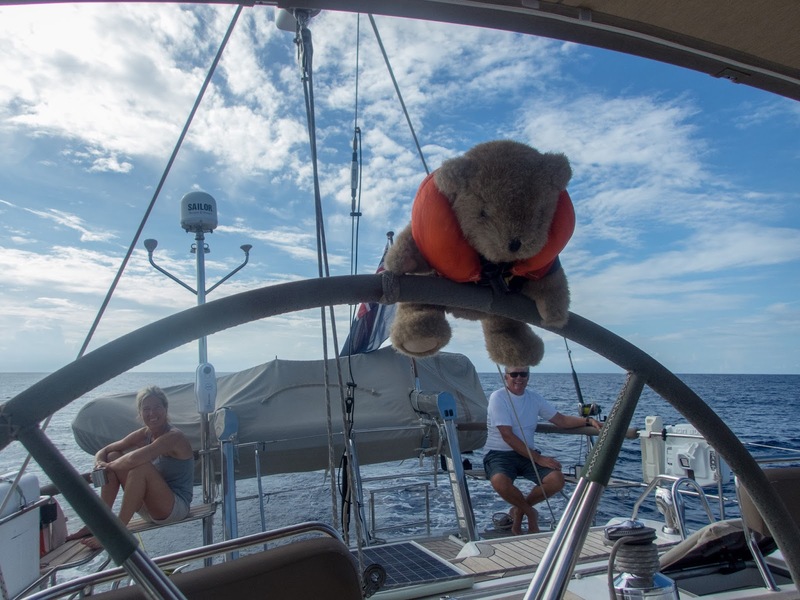 Our cruise boat had engine failure and so we did a series of DIY outings, which I think we actually preferred. PS how do we get a postal vote? 4 out of 5 of us will be out of the country. Alex: fans of hearing about our sat phone data allocation will be disappointed to hear I’ve got nothing to add on that front. Dad’s covered most of what we’ve been up to, although I feel Pippa’s contribution is underplayed – she barely gets a mention! It was lovely hanging out with her for the first time in six months: she’s still as competitive as ever; it was entertaining to compare her tan with ours; she may have mentioned once or twice that she’s got a boyfriend called Will… Mum breaking through security at Galapagos airport was a highlight, and thankfully the police decided to not get between a lioness and her cubs. 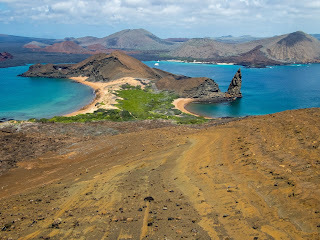 Every time you think the Galapagos have exhausted their wonders, they manage to surprise and delight once again. Uniquely unique. Oh, and many thanks to the universe for putting on an excellent private nightly shooting star show out here in the middle of the Pacific – it feels like you can reach out and touch the Milky Way, although given that there’s absolutely nothing for hundreds of miles around us, and a 4,000m drop to the sea floor, I haven’t tried too hard!